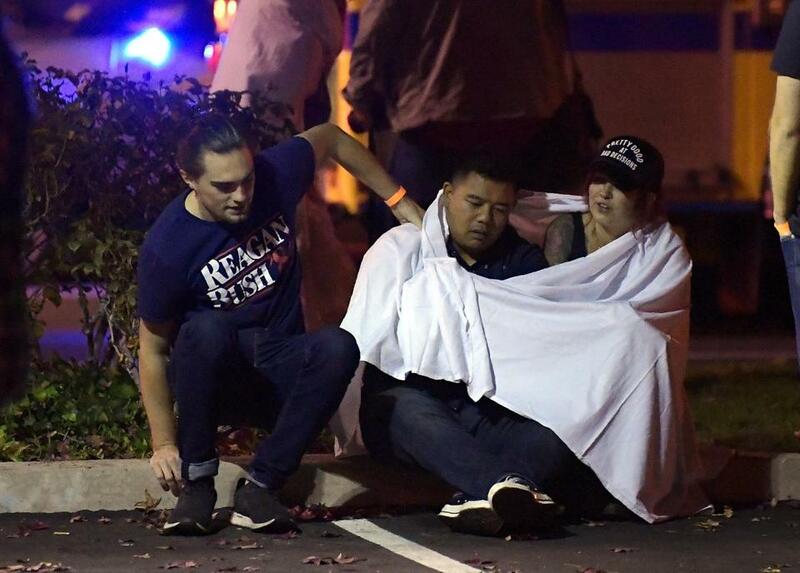 People comforted each other outside the scene of the mass shooting in Thousand Oaks, Calif., late Wednesday night. where a gunman opened fire inside a country dance bar crowded with hundreds of people. The motive for the rampage late Wednesday night was under investigation. The killer, Ian David Long, 28, was a former machine gunner and Afghanistan war veteran who was interviewed by police at his home last spring after an episode of agitated behavior that authorities were told might be posttraumatic stress disorder. Opening fire with a handgun with an illegal, extra-capacity magazine, Long shot a security guard outside the bar and then went in and shot employees and customers, authorities said. He also used a smoke bomb, according to a law enforcement official who was not authorized to discuss the investigation publicly and spoke on condition of anonymity. The dead included a veteran sheriff’s deputy who rushed in to confront the gunman, and a 22-year-old man who planned to join the Army, a freshman at nearby Pepperdine University, and a recent Cal Lutheran graduate. Scores of people stood in line for hours to donate blood for the wounded, and all morning, people looking for missing friends and relatives arrived at a community center where authorities and counselors were informing the next-of-kin of those who died. Jason Coffman received the news that his son Cody, 22, who was about to join the Army, was dead. Coffman broke down as he told reporters how his last words to his son as he went out that night were not to drink and drive and that he loved him. ‘‘Oh, Cody, I love you, son,’’ Coffman sobbed. President Trump praised police for their ‘‘great bravery’’ in the attack and ordered flags flown at half-staff in honor of the victims. Authorities searched Long’s home in Newbury Park, about 5 miles from the Borderline bar, for clues to what set him off. ‘‘There’s no indication that he targeted the employees. We haven’t found any correlation,’’ the sheriff said.